On Sunday night, the U.S. women's gymnastics team for the 2016 Summer Olympics was finalized, with five talented young women joining the team. The amazing athletes include Aly Raisman, Laurie Hernandez, Madison Kocian, Simone Biles, and Gabby Douglas. It's a pretty solid team, but some may be confused about Douglas nabbing a spot, especially since she placed seventh after the trials. 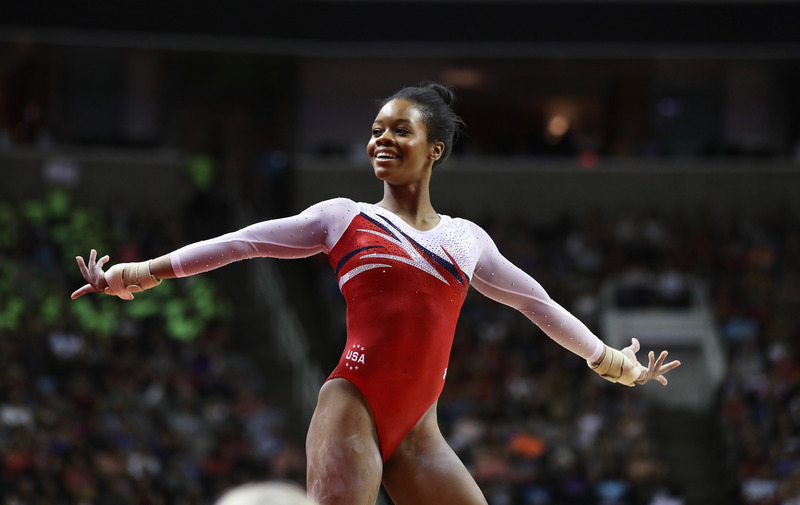 So how did Gabby Douglas make the Olympics team? Well, it's important to remember that the trials scores weren't the only factor in putting together the team. During the trials, Douglas fell off the balance beam both nights and didn't perform to her usual standards. But the fact that she knows how to deal with pressure and rise to the occasion when it matters most probably played into her making the team. Furthermore, national team coordinator Mártha Károlyi said of her skills on the uneven bars: "We feel that she can contribute to the team." She added, "The other events can be refined." Basically, she has faith in the gold medal winner's abilities. After the team was announced on Sunday, Károlyi also commented on her choosing Douglas over Ashton Locklear: "I feel like if we put Gabby in regimented training, with daily planning and daily assignments, we will see improvement — just like we did last year ... We have nine days of training camp, which is long, and we really put big importance on this training camp." It's important to also remember that scoring is very important when it comes to Olympics gymnastics, which is why Károlyi selected the combination that would produce the highest scores of all four events. That's where Douglas comes in. According to USA Today, the uneven bars is the weakest event for the Americans, but Douglas had the third-highest score at trials. While Locklear scored higher in that event, she doesn't do floor exercise or vault, but Douglas does. "The difference really was that Gabby can do the other events and Ashton can do only [bars and balance beam]," Károlyi said. "Ashton could bring almost a half-point plus for the team just by the bar routine. But then on vault, on the first day of competition, we’d have to put up Madison’s [lower-scoring vault] and that would reflect pretty bad on the U.S. team." She continued, "And if something happens to somebody, then on three-up, three-count, you’d put up a [lower-scoring] vault and that would really be a tragedy." Plus, Károlyi said Douglas is "well-liked by the international judges" and that they "needed this bars score." Douglas is thankful to be going to Rio and said, per WSJ, about her talents and performance, "I think physically I’m good. Mentally I am going to do a lot of visualization of routines. I have to be more mentally strong." As USA Today reported, she even commented on her lackluster performance: "The way I performed, it could just be so much better. And it will be."